Tumblr | Out of the Box! All of the Sports slides have now been digitized, and some of them are already appearing on the Sports @ Sam tumblr (shsusportscoll.tumblr.com), which will continue to update twice a week with more photos. While creating Sports @ Sam, I learned a lot about the different ways that institutions can use social media outlets such as tumblr, facebook, and twitter to connect with other institutions, patrons, and the community. Making collection-specific social media sites, such as the Sports @ Sam tumblr page, can create interest and promote the institution (both the Archives and the University) while also providing examples of what students or researchers can find in the special collections and University archives, so that the next time a student has an assignment or a researcher/faculty is considering a new topic, they might be reminded to come by the Thomason Room or the Archives department and see what is available. Moving forward for my final week here as the Special Collections and University Archives Intern, I have been preparing a physical display which will also draw heavily from the Sports slides collection, much like the Sports @ Sam tumblr. The display will showcase SHSU Sports history, using prints from the Sports color slides and also incorporating some older photos, dating back to the 1910s. The bulk of the preparation went into creating a poster for the display and writing captions for all of the prints. Next week I’ll provide photos of the display and provide more details about all of the different elements as they come together. As my summer internship draws to a close I have been thinking about all of the skills I’ve acquired and all I’ve learned through the experience of processing and displaying this collection, and I feel that I’ve gained a wealth of knowledge about the different departments (Special Collections/Thomason Room, Archives, and Digital Resources) which work together to preserve and provide access to all of the rare and unusual documents and items that we have here at Sam. I feel that the experience I’ve had here will be very valuable for me in the future, and I also hope that the work I’ve done will be useful to others as well. We are proud to announce a new Tumblr webpage created by the SHSU Special Collections and University Archives Departments’ intern Amanda Chang, which spotlights SHSU Sports teams from seasons past. 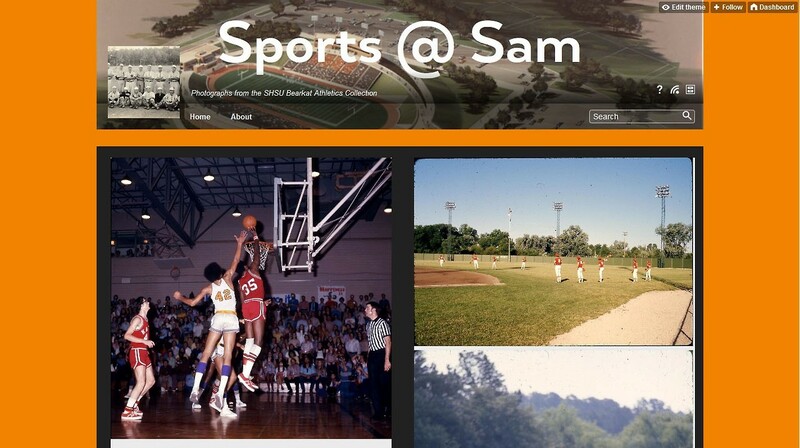 The “Sports @ Sam” Tumblr updates each Monday and Friday with a new photograph showcasing athletes from the 1980s, ‘70s, ‘60s, and beyond. Many of the photographs come from a recently digitized collection of color slides dating from the late 1960s to the early 1980s, which feature mostly baseball, basketball, football, golf, and softball photographs. The slides were originally created by the Sam Houston News Bureau in 1970s and the Sam Houston Public Information Office in the 1980s. Along with these photographs, older archived photos will also be posted. Athletes have been playing for Sam Houston State for over 100 years, starting out as the “Normals” when SHSU was known as a Normal Institute, and later switching to the “Bearkats.” Throughout the years our sports programs have developed into the strong teams which represent our University today. Our sports programs have grown along with the University, and this is reflected in many of the photographs that will be posted on Sports @ Sam. Not only do these photographs feature the athletes themselves, but also the fields and gymnasiums, and later stadiums and coliseums, that each team called home. Sports @ Sam offers an opportunity to look back on the teams that created a solid foundation for today’s student athletes. Sports @ Sam can be found at shsusportscoll.tumblr.com or, and the Special Collections and University Archives Departments’ Tumblr can be found at nglspecialcollectionsandarchives.tumblr.com.